CORPUS CHRISTI, TX – Removing reminders of Hurricane Harvey is keeping crews hard at work. Three quarters of the City’s estimated 275,000 cubic yards of storm debris have already been collected. The City’s four Solid Waste Services teams and 13 contractor crews will continue to work together to complete the final sweep. 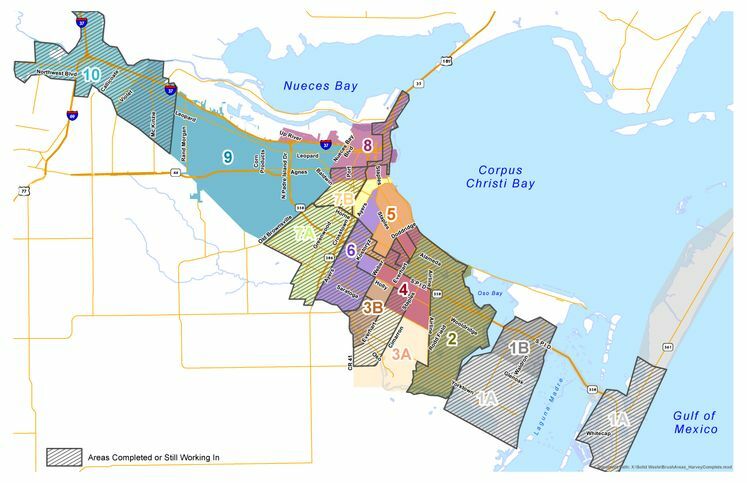 In approximately two weeks, the first sweep of Corpus Christi’s storm debris cleanup will conclude and the final sweep will begin. Crews will return to the same areas to collect construction debris and any leftover brush. The City’s contract for debris removal does not include businesses and commercial properties. These establishments will need to hire a contractor to dispose of their debris. They can also take it to the J.C. Elliott Transfer Station located at Highway 286 and Ayers Street. For more information, contact Celina Ybarbo Pulcher, Program Outreach Coordinator at (361) 826-1655 or by email at Celina@cctexas.com.